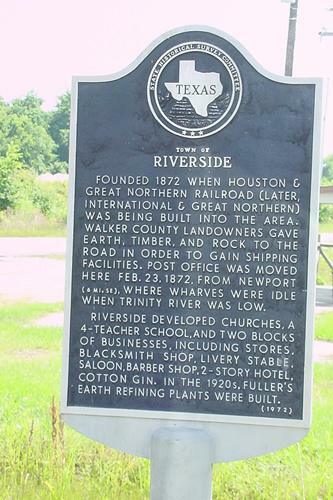 When Riverside was established in 1872 by the Houston and Great Northern Railroad, the combination of river and railroad gave the town unlimited potential. That same year a post office was moved from its former location at Newport. Cotton was the town抯 first economic engine, then lumber. As the trees thinned out, Riverside started raising cattle. By 1880 the population was 200 and besides essential businesses, the town also had two hotels and two general stores. By 1990 Riverside added a saloon and restaurant as well as three churches and two schools. 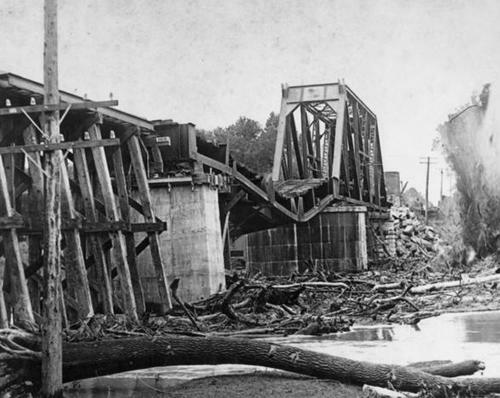 But even with a railroad and river, the town started losing population. By 1914 it had decreased to a mere 50. Fuller's earth* was discovered in the area in 1920, and two plants were opened, giving the town a reprieve from impending oblivion. 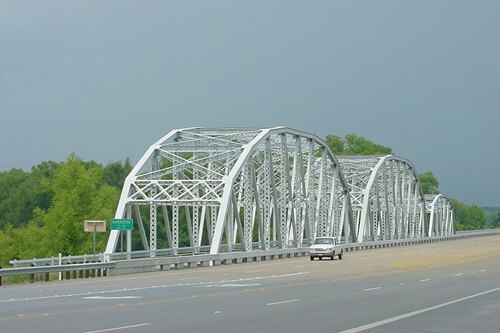 The population increased in the early 1930s, to 300 and remained at that number until the Riverside schools were merged into Huntsville抯 ISD in the 1960s. From a 1990 census figure of 451 residents, the 2000 population had declined slightly to 425. *a clay-like material used to decolorize and purify oils. 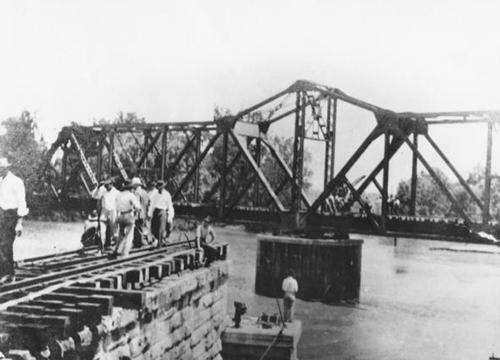 Founded 1872 when Houston & Great Northern Railroad (later, International & Great Northern) was being built into the area. 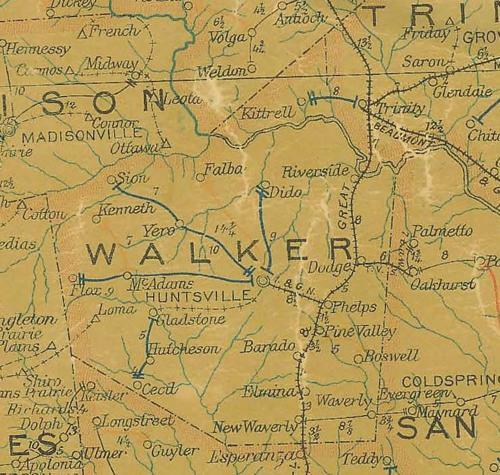 Walker County landowners gave earth, timber, and rock to the road in order to gain shipping facilities. Post office was moved here Feb. 23, 1872, from Newport (6 mi. SE), where wharves were idle when Trinity River was low. 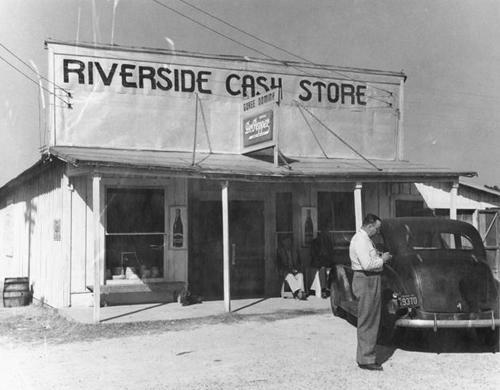 Riverside developed churches, a 4-teacher school, and two blocks of businesses, including stores, blacksmith shop, livery stable, saloon, barber shop, 2-story hotel, cotton gin. In the 1920s, Fuller's earth refining plants were built.